People relaxing at a street cafe in St. Tropez in the Var region of Provence in France, Europe. Before the 1950s St. Tropez in the Var region of Provence in France, was a quiet little fishing village at the end of a peninsula. During World War II the Allies landed on the beaches in the area, and the town received heavy bomb damage.All this changed in 1956 when Brigitte Bardot and her husband Roger Vadim decided to make a movie and use St. Tropez as the setting. Young Parisians and celebrities suddenly 'discovered' St. Tropez in Provence and it was the place to be.Today, during the summer months, the fishing boats are outnumbered by the luxurious yachts. 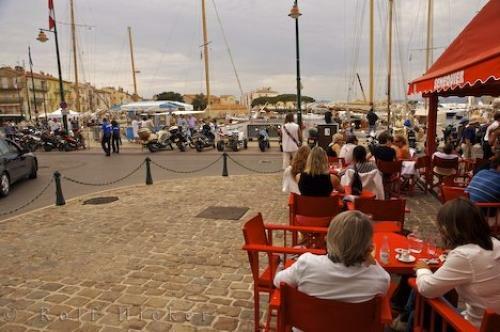 The street cafe is an ideal spot to watch for the rich, famous or even infamous.Visitors in May or September will find St. Tropez in Provence, not quite as crowded and can enjoy the street cafe at a more leisurely pace.Street cafe in St Tropez, The Var, Provence, France, Europe. Photo of a street cafe in St Tropez in the Var region of Provence, France in Europe.